A wee while back, Marvel ran a series of teasers promoting candidates to step into Matt Murdock's bright red boot made footsteps, as the new 'Man Without Fear'. 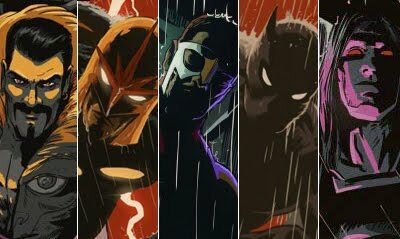 All images were rendered by current Black Panther: Man Without Fear artist Francesco Francavilla, and while they seemed to all fit together (what is it with this week and inter-connecting images?) one piece was missing and never revealed. 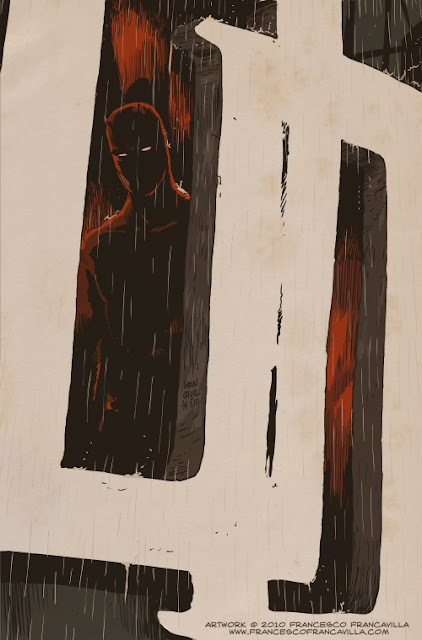 Francesco has posted this, the missing part of the puzzle on his own blog, which features Daredevil in shadow, hinting at Matt Murdock's disappearance from his own title. The entire connected image, featuring Nova, Gambit and all the other nominees, is awaiting your eyes only, right after the jump. so Matt Murdoch pulled a Bruce Wayne and disappeared, and now the mantle of DD is up for grabs? Kinda Craig, Matt got possessed by a demon (don't start me started) and by the end of Shadowland Hell's Kitchen was left without a Daredevil. Marvel ran the above teasers as to which hero would fill in for Matt in the Daredevil book, while mini series Daredevil: Reborn runs, and the winner has been revealed to be Black Panther (though Gambit would've been great). Black Panther in the pages of Daredevil is been drawn by Francesco so it really is worth checkin out! I've officially thrown myself off the wagon now thanks (the kids are getting me X-Force, HFH, and Lady Mechanica...not sure they know it yet but Mrs. D has them on order). Do I really need to add insult to injury? I guess I did need a hobby other than the Mr. Mom thing. Kids give you comic subscriptions?! Why didn't someone point out this benefit earlier?! There had to be a perk to it. I think I just found the loophole.